Less than a week ago, the Los Angeles Kings won their first Stanley Cup Championship in franchise history. Since then, the Kings have been busy showing Lord Stanley’s Cup the Hollywood lifestyle. From late night partying, to appearances on various late night talk shows the Kings have become Hollywood’s biggest stars. However, things did not feel official until the parade. The people of Los Angeles have witnessed championship parades before, and have seen the streets lined with purple and gold just a frequently, Lakers purple and gold. Not this year. This year thousands of people lined Figueroa in Kings gear and championship memorabilia, a sight most termed as the Black Parade. Kings fans had waited a very long time for this event, and being casted in the shadows of the Lakers for so many years they savored their time. Below is the video of the parade just after the intersection of Figueroa and Olympic and just before the buses turned into the LA Live Plaza. 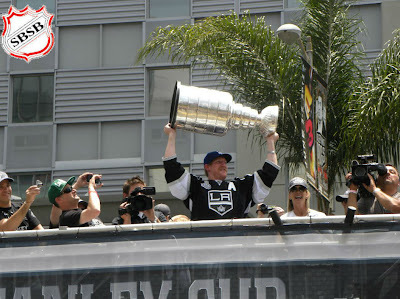 Matt Greene wears a stahce only fit for a champion. Trevor Lewis has a little Captain Morgan in him. The LA Kings Ice Crew doing what they do best.